Portland’s all about the food! Have you seen the Travel Channel’s Man v. Food? The host, Adam, eats everything imaginable, and in his recent video post, he sets his sights on Portland. Both Cooking Light magazine and Man v. Food love Portland’s amazing repertoire of restaurants and eateries. 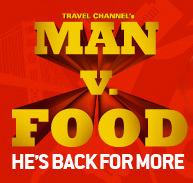 Not familiar with the Travel Channel’s Man v. Food? This guy goes up against the biggest meals you can imagine in a desperate attempt to… well… actually, we have no idea what he’s trying to prove. It’s one of those “car crash shows” where you can’t turn away because it’s so horrible to imagine you have to keep watching. Cooking Light magazine ranked Portland a top food city due to residents being able to keep animals at home, the wide variety of cooking classes and the carts. At the same time, but in a totally different place, Adam from Man v. Food recently raved about Portland In a recent video blog post. Truly, what’s not to love? Check out our reviews of some of our favorite restaurants below. Plus, if you have a great restaurant or other Portland activity that you’d like to recommend, leave it in the comments! Copyright © 2010-2019 Stumped in Stumptown. All Rights Reserved.